Construction companies that take the traditional approach to planning their operations may find themselves falling behind their competitors who adopt virtual planning technologies being studied by Purdue researcher Julio Martinez. Martinez, associate professor of civil engineering in CEM, is using support from the National Science Foundation for his research that combines discrete-event simulation (DES) and virtual reality for construction operation planning. His work enables construction companies to carry out their operations virtually to maximize their risk awareness and adjust their plans accordingly before operations begin. Used at its full potential, Martinez says the DES-based virtual reality unique to his research can help construction decision makers save lots of money for their firms by improving how they plan, how they manage risk, and by increasing their overall efficiency. "Through DES-based virtual reality, I want the people who are in the experience to feel that they are actually watching and moving about in a place where a construction operation is going on," Martinez says. "There are uncertainties. While we have an expectation of how it's going to come out, without prior virtual construction, we have no serious understanding of how it can develop." Martinez cites the example of a construction project requiring ready-mix concrete deliveries. "We could have the truck come and we would watch what happens, looking to find ways to make the process more efficient," he says. "We would ask, 'Did I have too few people waiting for the delivery to place the ready-mix? Did the trucks have to wait? Or did I have too many people, so some were standing around with nothing to do?'" 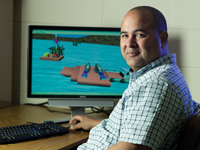 Martinez' research is geared toward enabling construction firms to tailor their own simulations specifically to their unique construction operations and to avoid the common and costly practice of learning about their inefficiencies after operations are under way. "Simulation lets you go through that first day on the job, see how it went and how you can do better tomorrow and the next day, and so on," Martinez says. "By the time you are ready to start the actual project, you've gone through the complete improvement process virtually, so the operation has already run virtually at peak performance." Born and raised in the Dominican Republic, Martinez obtained his five-year professional degree there at the Universidad Católica Madre y Maestra. Subsequently, he came to the United States where he completed two master's degrees, one in civil engineering and another in construction engineering and management. He earned his PhD in civil engineering at the University of Michigan. After 10 years on the faculty of Virginia Tech in Blacksburg, he joined the Purdue faculty in 2007. Martinez says he is gratified when fellow researchers benefit from his work and when his research inspires his students. "When I develop an idea and my colleagues at other schools build upon it to do their own work, that's very satisfying," he says. "And it is very rewarding when you find bright minds and are able to help them develop the ability to find their own tough scientific questions and answer those questions in widely applicable ways."